Michel Legrand passed this weekend, at 86 in the city where he was born, the City of Lights, Paris. He was active to the end. He was booked for concerts upcoming in the spring. As a composer, Legrand’s work defined “prolific” and “eclectic,” also “multi-media,” and in the musical DNA of virtually all of his work was jazz. His first album, at age 22, I Love Paris in 1954, featured classic songs about Paris and was a best-seller. When offered a chance to record with an orchestra, he told me that he asked for a Who’s Who of players — and he got them: Miles Davis, John Coltrane, Phil Woods, Bill Evans, among other jazz stars. 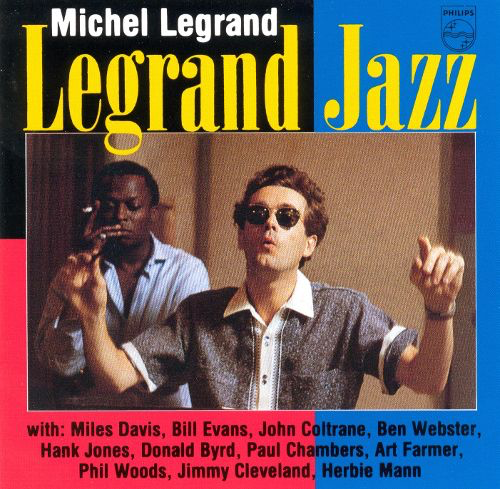 Legrand Jazz, released in 1958, offered his hiply beautiful arrangements of jazz standards, opening with Miles playing the lead on an exquisite “Jitterbug Waltz.” Miles and Michel remained the best of friends, and in 1991 Miles starred in and, together with Michel, created the music for an Australian movie called Dingo, about a musician who comes from the Outback to Paris. Legrand composed more than 200 scores for TV and movies, including hundreds of songs. He worked on several musicals for the stage. Amour, on Broadway in 2002, was a flop, but Legrand’s music was nominated for a Tony. Marquerite, a 2008 musical adapted from Camille by the creators of Les Miserables, was a hit in London with music composed by Legrand. Nominated for countless awards, Legrand won five Grammys and three Oscars. Oscars telecasts for years presented nominated songs with absurd or even ridiculous productions. Legrand eclipsed all the nonsense in 1969, alone at the piano and singing “What Are You Doing The Rest of Your Life?” from The Happy Ending. He didn’t win — but he should have. He did win in 1968 for the Best Song, with lyrics by the Bergmans, “The Windmills of Your Mind” from The Thomas Crown Affair. As the movie begins, with Steve McQueen (as Thomas Crown) orchestrating an art theft, the scenes of the theft played on simultaneous multiple screens. Michel told me that when the movie was first edited it was hours too long. He said that he asked the producers how long they wanted the movie to be. He said that he’d go away for several months and compose an entire score of that length, so that the producers could cut the movie to the music, especially the quick-cut multi-screens of the robbery. Legrand’s score was nominated, but only “Windmills” won. Through all the years of his musical life, from his 20’s into his 80’s, Michel Legrand enjoyed himself always musically. He recorded with jazz piano trios. At Shelley’s Manne-Hole in 1968 is one of his most memorable albums. Other jazz albums featured musical friends, especially Phil Woods, Randy Brecker, and fellow maitre Stephane Grappelli. Legrand’s album with Sarah Vaughan is a masterpiece, and he obviously enjoyed working with singers of his songs, from Lena Horne to opera diva Kiri Te Kanawa. Two of his most recent albums featured French chanteuseNatalie Dessay. And in 2017 Legrand recorded two mammoth works, concertos for piano and cello. I’ll celebrate the life and songs of Michel Legrand next Sunday, 10AM-2PM, with Singers Unlimited.